Every now and then a new product comes along that needs it’s own blog post for which to review it. This. Is. That. Product. First of all, let me say that I love everything about Siete. Up until now, I had only had their tortillas, which are delicious, by the way. I love that the company uses simple ingredients and I LOVE that there are so few! Whole foods means not packaged and processed, and in a perfect world, every food that entered our mouths would be whole. But let’s face it, we don’t live in a perfect world and something’s just wouldn’t taste very good, or can be toxic in their natural state, like cassava. Cassava is a starchy root and is found other names like yuca, manioc, mandioca, yucca root, casabe, and tapioca. Now you may have just caught that it’s a starchy root. So are sweet potatoes. So can you eat the entire bag in one sitting? Absolutely! Should you? Absolutely not! So portion them out like I recommend you do almost anything else you’re munching on so as not to over do the good stuff! 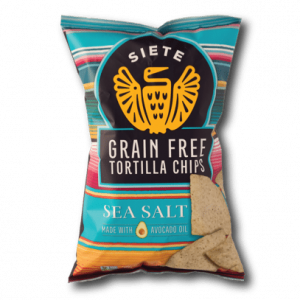 So the brilliant people at Siete used the best of a few ingredients, and came up with what I am convinced is one of the best products on the planet. Behold, the chip! 5 ingredients, y’all. 5. Cassava Flour, avocado oil, coconut flour, ground chia seeds, and sea salt. That’s all. On their own, with some no sugar added salsa (Mateo’s is my fav), made nacho style, or however else you enjoy them, just enjoy them. I always have to add in when my very VERY picky middle child likes anything. She said they rivaled her favorite restaurant tortilla chips! And there you have it from the mouth of babes! Can’t wait to hear what you think about these bad boys!